5 tourist places in bali island - Located in the east of the island of Java, Bali Indonesia excellent tourism is already well-known throughout the world. Besides well-known for its natural beauty, especially its beaches, Bali is also famous for the arts and culture are unique and interesting. 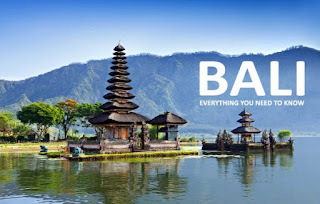 Bali as a tourist destination complete and integrated has many interesting sights, any tourist spot in Bali must be visited? Kuta beach is a tourist place in Bali's most famous and most visited by tourists because of its location close to the airport, its beautiful beaches, low cost, and the waves are suitable for novice surfers. Kuta Beach is also famous for its panoramic sun sinking very beautiful. Unique facts of Kuta Beach is before the Kuta Beach into a tourist spot in Bali that must be visited, as now, Kuta Beach is a major port, a trading center in Bali. With white sand and blue sea, equipped with a very complete supporting facilities, is a prime tourist spot Kuta Beach Bali. Lake Beratan Bedugul is a lake located in a mountainous area with a beautiful natural atmosphere. The uniqueness of Lake Beratan Bedugul is the existence of temple called Pura Ulun Danu. Ulun Danu is located on the edge of Lake Beratan Bedugul and is one of the main attractions of Lake Beratan Bedugul. In addition, tourists can also enjoy a game of water and rent a boat on Lake Beratan Bedugul. Lovina beach may not be too often heard among tourists. Lovina Beach is one of the tourist spots in Bali's my favorite because of Lovina we can see dolphins swimming and jumping in their natural habitat. Located in Northern Bali near Singaraja, you will go to sea and see the dolphins using fishing boats. Lovina Beach Dolphins playing on the beach in the morning, therefore, usually tourists set off from the coast starting at 6 am. Monkey Forest is a tourist place in Bali that will bring you one with nature. Situated in Ubud, Bali, Monkey Forest is a forest inhabited by many wild monkeys. The monkeys are considered sacred by the locals so that should not be disturbed and allowed to live in the woods. Monkeys in Monkey Forest really liked the food, they will try to get the food you take, even if the food is in your bag. In this place you will watch the lives of hundreds of monkeys are unique and interesting. Kecak is a Balinese dance the most famous and most interesting to watch. Of the many places that show the drop Kecak, I think the most interesting is the Kecak Uluwatu is located at Uluwatu. Kecak Uluwatu Kecak Balinese demonstrates against the background of sunset at Uluwatu very beautiful. Kecak Uluwatu very popular and crowded therefore if you want to watch the show Kecak Uluwatu, I suggest to the message from the distant days.